I received a few packages of Kona solids in the mail recently, and I think I'm hooked. I LOVE solids. They just look so beautiful and simple. 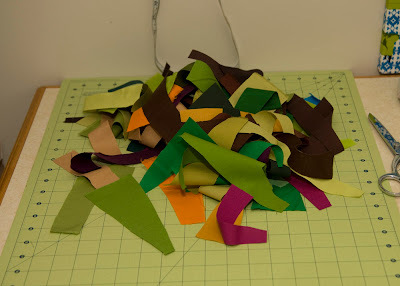 I have had dozens of ideas going through my head recently using only solids, but haven't cut anything until today. This project just felt right for me right now. 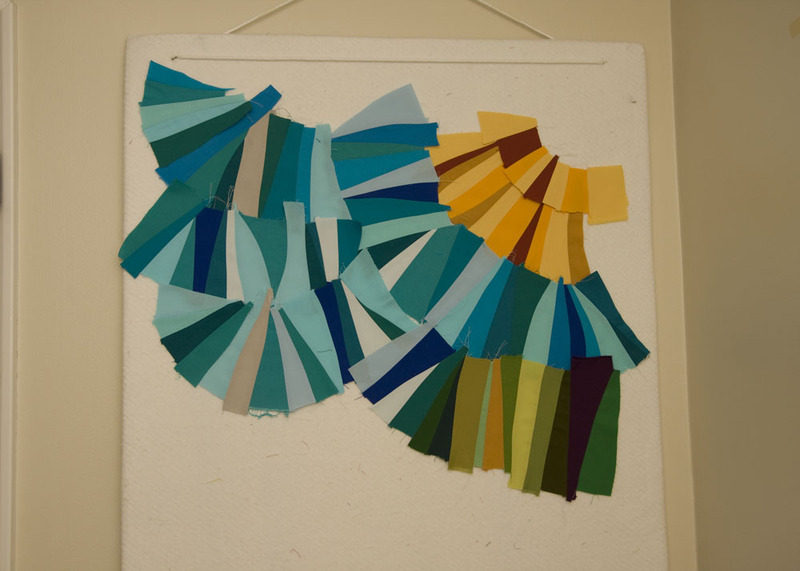 I think in quilting and in life I get so caught up in perfection that I forget the beauty and simplicity of imperfection. 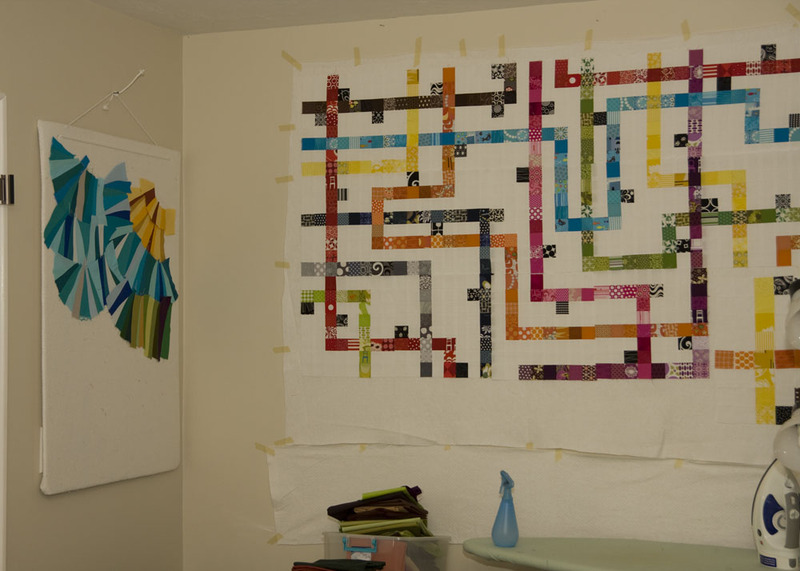 I have been trying so hard to get all of my corners perfect in this insane subway quilt that I'm going crazy. I do the same thing as a mom and wife at times. I worry so much about what I should do to be the perfect mom that I make myself crazy. Today during my quiet time while the kiddos are asleep, I've been embracing imperfection. You know what? I'm loving it. I can't wait to see what this becomes. I'm just sewing. No perfect 1/4" seams. No rotary cutter. Just me, my scissors, my sewing machine and a super hot iron with lots of water. I'm using the piecing technique shown in the Mod-Mood quilt-along from daintytime. I really like the contrast between my two projects hanging next to each other. I'm being paged by a child who decided she is done napping for the afternoon. It's time to be the mom again, but tonight after they are all asleep, I plan to continue working on my "forest" with all of these great pieces. look at you so avant garde. I love the colors you are working with. 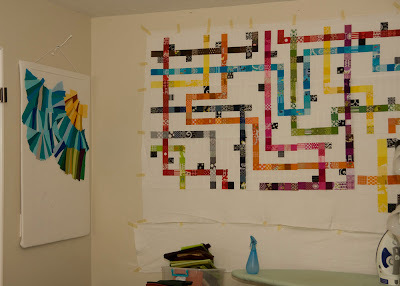 And your subway quilt would drive me bonkers having to match up all of those seams - but it sure is beautiful.